The groups, backed and trained by Tehran, delivered a statement from the home of Iran's consul-general in the Shi'ite holy city of Najaf. 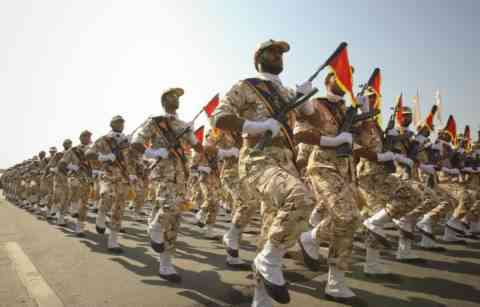 President Donald Trump said last week he would name Iran's elite Islamic Revolutionary Guard Corps a terrorist organization. The action by Trump, who has taken a hard line toward Iran by withdrawing from the 2015 Iran nuclear deal and re-imposing broad economic sanctions, marks the first time the United States has formally labeled another country's military a terrorist group. "This is laughable coming from the number one sponsor of terrorism, America," said a spokesman for the Badr Organisation, without providing evidence. Badr is led by Iraqi militia commander and politician Hadi al-Ameri who's Fateh coalition of militia groups has the second-largest number of seats in Iraq's parliament. Iraqi Prime Minister Adel Abdul Mahdi said on Tuesday that Washington's decision to designate the IRGC a terrorist group could harm his country and the wider region. Iraqi security forces declared victory over Islamic State in 2017 with help from a U.S.-led coalition and Iran-backed Shi'ite militias, some of which fought U.S. troops earlier following the 2003 U.S.-led invasion that toppled Saddam Hussein.